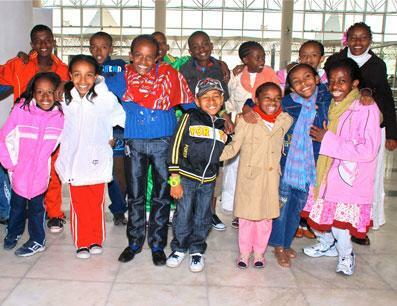 Helping to make the world a better place, JDC works in Ethiopia to provide children affected by severe spinal deformities with life-saving spinal surgeries. Ethiopia is one of the poorest countries in the world. Because the country does not have a solid public health system, children born with spinal deformities have nowhere to turn to for help. So their spinal problems, uncared for, can be physically crippling and even life threatening. Based on the idea that we all have the responsibility to help the poor and the sick, JDC gives the neediest Ethiopian children a new chance at life by sponsoring spinal surgeries for them. Since the local health system in Ethiopia doesn’t have the expertise to provide treatment, JDC transports these children to Ghana for their surgeries, covering the cost of the operation as well as logistical, travel, and pre-surgery support. Since 1914, the American Jewish Joint Distribution Committee (JDC) has given global expression to the principle that all Jews are responsible for one another. JDC is the world’s leading Jewish humanitarian assistance organization, working in more than 70 countries and in Israel to alleviate hunger and hardship, rescue Jews in danger, create lasting connections to Jewish life, and provide immediate relief and long-term development support for victims of natural and man-made disasters. Across the globe, JDC is carrying out the principle of Tikkun Olam (repairing our world) and making the world a better place – for Jews and non-Jews alike. JDC’s efforts to provide humanitarian relief focus on helping those who are the neediest and most vulnerable in the world. JDC's humanitarian projects in non-Jewish communities assist the most distressed communities around the world within a Jewish framework of helping the poor. These projects also serve to build strong positive relations between Jews and non-Jews. Bezawit is 17-year-old and lives with her grandparents. Her grandfather is blind, and she herself does all the shopping and cooking for the family. When she was a child she went to the hospital on account of her crooked spine, but was told that no treatment exists to help her. However, a few years later she heard about the help JDC was providing children with spinal deformities. Bezawit met with the JDC doctor who diagnosed her with scoliosis and provided her with the first hope she had ever had for a cure – the opportunity to undergo spinal surgery. In November 2009 Bezawit was sent to Ghana for the surgery. The surgery was extremely successful and now Bezawit is able to move and function like other kids her age. Bezawit is so grateful for the help she has received that she now dreams about becoming a spine specialist. Approximately 350 children have benefitted from spinal surgeries since the program began in 2004. An additional 30 surgeries are planned for the remainder of 2011. These life-altering surgeries enable the children do things they have never done before - like walking upright, running and jumping!